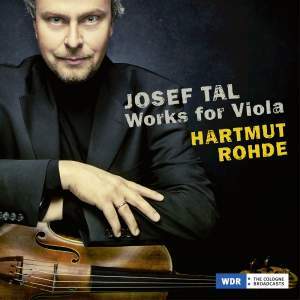 Avi Music has announced the release of German violist Hartmut Rohde‘s new album: Tal: Works for Viola. Recorded with pianist Christian Seibert, the disc features the complete works for viola and piano of Israeli composer Josef Tal (1910 – 2008) – a student of the prolific German composer and violist, Paul Hindemith. “I was generally interested in the music inspired by Hindemith or surrounding his time … music reflecting the period of leaving the romantic period searching for new paths …” Hartmut has told The Violin Channel. “We’ll never know how Tal would have continued as a composer in Germany or Europe without the historical fate of needing to leave Berlin …” he has said.